$25 can plant five native trees as a streamside buffer. $100 can buy water quality equipment to enable us to identify pollution problems. $500 can help 50 students be River Explorers for a day of learning in a river or creek. 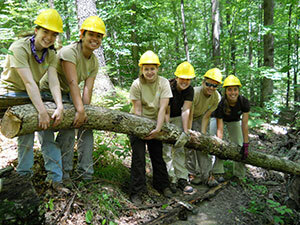 $1,000 can fund a high school Youth Conservation Team for a day of conservation work and learning. Donations to ORF are tax-deductible to the full extent of the law. On this page you can make a donation, become a member, or renew a membership. We know how important water is to you. Reducing pollution, restoring habitat, educating and training the next generation of environmental stewards, and ensuring clean water for you and millions of fellow citizens, all keeps us working on your behalf. But we can't do it without you. Please support ORF with your most generous tax-deductible donation using the form below. You can also be a monthly giver for as little as $5 a month. If you'd like to make a donation to ORF in honor or memory of a friend or loved one, you may also use this same form.